When, in the third century B.C.E., the Ptolemies became rulers in Egypt, they found themselves not only kings of a Greek population but also pharaohs for the Egyptian people. Offering a new and expanded understanding of Alexandrian poetry, Susan Stephens argues that poets such as Callimachus, Theocritus, and Apollonius proved instrumental in bridging the distance between the two distinct and at times diametrically opposed cultures under Ptolemaic rule. Her work successfully positions Alexandrian poetry as part of the dynamic in which Greek and Egyptian worlds were bound to interact socially, politically, and imaginatively. 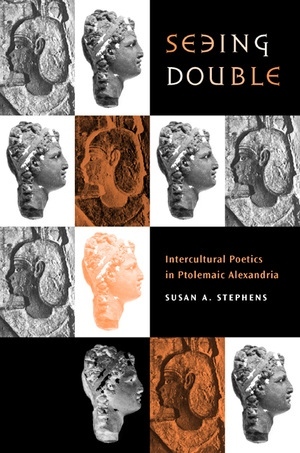 The Alexandrian poets were image-makers for the Ptolemaic court, Seeing Double suggests; their poems were political in the broadest sense, serving neither to support nor to subvert the status quo, but to open up a space in which social and political values could be imaginatively re-created, examined, and critiqued. Seeing Double depicts Alexandrian poetry in its proper context—within the writing of foundation stories and within the imaginative redefinition of Egypt as "Two Lands"—no longer the lands of Upper and Lower Egypt, but of a shared Greek and Egyptian culture. Susan A. Stephens is Professor of Classics at Stanford University, author of Yale Papyri in the Beinecke Rare Book and Manuscript Library II (1985), and coeditor of Ancient Greek Novels: The Fragments (1995) and Didymus in Demosthenem: Commenta (1985).